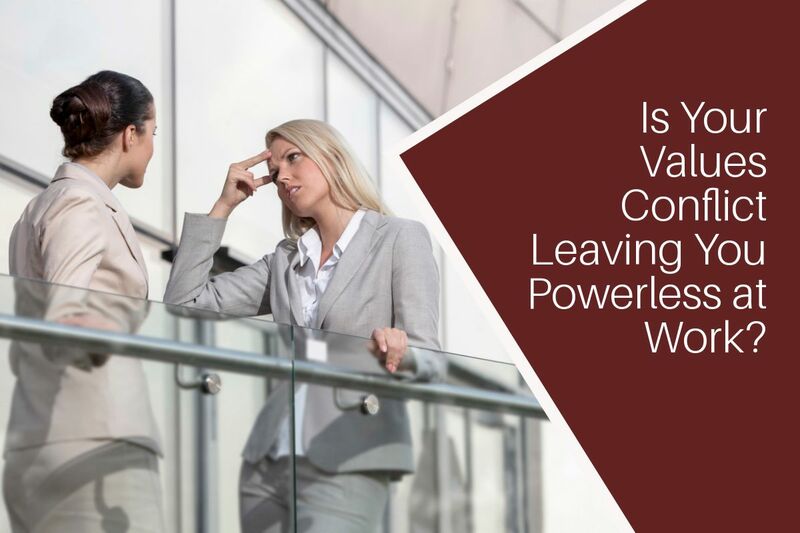 Home » Is Your Values Conflict Leaving You Powerless at Work? Does your employer’s values frustrate you and your mission? Here’s 4 quick tips to help you avoid those dreaded conflict of values at work. If you’re a purpose-led, driven and ambitious woman, you want to know your work makes a difference. Well, duh! And that’s why there can be nothing more infuriating (or downright disheartening) when your employer’s values seem to frustrate your mission and ability to get meaningful results. A recent client of mine, Sandra, was passionate about her area of expertise in helping disadvantaged, vulnerable people in distress. But during our coaching sessions she could barely stop talking about how much she disagreed with her organisation’s direction, priorities, KPIs and the rest. Her focus on what she perceived as the failings and deficiencies of her employer was so intense it was causing her great stress. She felt as if she was on a crusade and was needed to fix the entire industry. And that was a major problem. Because her desire to fix everything was so overwhelming it was having a detrimental impact on her attitude, day-to-day satisfaction and effectiveness. In other words, it was draining her personal power, confidence and belief her ability to make a difference. Not. Good. At. All. What she didn’t realise, was that she was steadfastly stuck in the gap between her employer’s values and her own. She had a totally different idea of how clients’ best interests should be served. With her focus was squarely fixed on what she saw as “the problem”, her feelings of disempowerment were crowding out thoughts of a solution. In short, the situation was not sustainable. Maybe this scenario resonates with you? It certainly has with me! It can be a painful and frustrating thing when we discover our values are not the same as the organisation we work for. Sometimes this division has become so stark we may choose to leave. But equally there might be a whole host or reasons you want to stay. So, if you choose to stay, how do you make it work for you, your wider mission and your organisation? (Because if you don’t, you’ll become the friend who people start avoiding because all you do is complain about your job.) How do you keep doing your job from a place of empowerment, instead of frustration and powerlessness of being stuck in the values gap? Here’s 4 tips I’ve used myself in tricky situations and helped clients implement. No. You’re not. One sure fire way to blunt your personal effectiveness is to believe that you have to “fix” every problem, travesty, failing of your organisation, industry or department. I get it. Once you see these things it’s hard to unsee them. But if you fall into this trap you run the risk of burning out or having a pessimistic and cynical “what’s the point” attitude take over. And that is NO help to anyone. Pick your battles! Stop focusing on all the things that are beyond your control to change and put your energies where you can make a difference on the ground every day. Be clear on the difference you make, why it’s important for you to do your best and for who. And take effective action regardless of whether it’ll be noticed or not. That IS the point! Do things that play to your strengths and values. Take on any opportunity that gives you the space to be your best (no matter how small). You always have a choice in any moment to show your values in action. I love this idea which I discovered from Dr Russ Harris. Pursue what’s important to you with vigour, focus and energy. But it’s ok to hold them lightly. I guess that’s another way of saying sometimes we have to detach from the outcome. I’m not pretending this kind of workplace struggle is easy. But short of leaving, if YOU don’t take proactive measures to put your energy and focus on what you can control, you’re simply selling yourself short and reducing your options for positive action. To stay connected with the wonderful community of people at Empowering Ambitious Women, remember to follow our page on Facebook @EmpoweringAmbitiousWomen.